RealDNS is an application that updates your hostnames with the latest IP address of your computer, to the following dynamic DNS providers: Dyn, NoIP, FreeDNS, ChangeIP, DuckDNS, XpertDNS, Strato, DynDNS.it, DtDNS, EasyDNS, DNS Made Easy, CloudFlare, Google Domains, Namecheap, Hurricane Electric, Loopia, OpenDNS so that you will always have an updated hostname allowing you to connect to your computer/devices from everywhere. iCloud sync - Sync all your accounts and hostnames using iCloud to your iPhone or iPad. Multiple accounts, multiple hostnames, multiple IP sources - Add multiple accounts for each provider with multiple hostnames that have different IP sources. Internal failover - allows the application to update your hostname with the IP address of an available network interface if the network interface assigned to your hostname is not available. Provider failover - this option allow you to make hostname updates to multiple providers at the same time, so in case a provider will be down your IP address will be saved to the other enabled providers assuring that you will always have a hostname updated with your latest IP address. Logs - all your actions and the dynamic DNS provider responses will be displayed on the log view. Hostnames - multiple hostnames can be updated simultaneously. Run at login - the application can be set to run at login so that hostnames will be always updated in the background with no user interaction, even if the computer restarts. 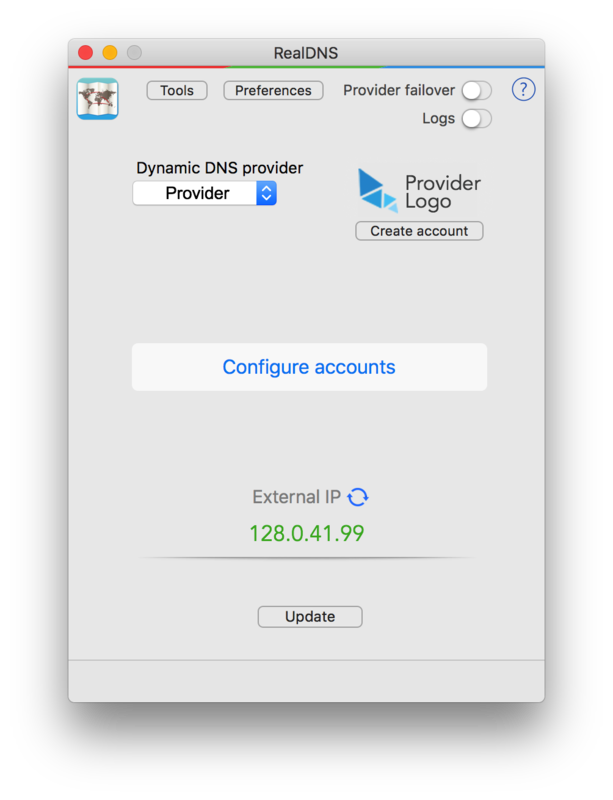 The best dynamic DNS update client on App Store for Mac OS X and iOS. In Single mode the application will provide a light, easy and intuitive interface. In this mode the application will use only one dynamic DNS provider which can be configured with multiple accounts and each account with multiple hostnames. In Provider failover mode the user can chose to enabled any provider with the possibility to use all enabled providers simultaneously to perform updates. As in Single mode every provider can have multiple accounts and every account can update multiple hostnames with different IP sources. All your actions and the dynamic DNS provider responses will be displayed on the log view. Every dynamic DNS provider has a separate tab in the log view so that you can differentiate all actions and responses of each provider. You can enable or disable the auto-update function from the log view and monitor the time remaining until auto-update function will execute the updates. You can sync all your accounts and hostnames using iCloud to your iPhone or iPad from the "Sync" button. Clean your local DNS cache of bad results that sometimes will be cached in your local DNS cache and therefore need to be cleared from the cache in order for you to communicate with the hostname correctly. IP history View your successful hostname updates and what IP address the hostname had in the past. System IP configuration View all your system IP addresses. Hostname tools You can use the tools to manage and monitor your hostnames. Type any valid hostname in the hostname textfield or select a hostname from all the hostnames in the application by clicking the "Select hostname" button. After a valid hostname has been entered or selected you can run any of the following operation on it: Show IP, Ping, Whois, Dig or Geo IP. Add multiple accounts for each provider with multiple hostnames that have different IP sources. Internal failover allows the application to update your hostname with the IP address of an available network interface if the network interface assigned to your hostname is not available.